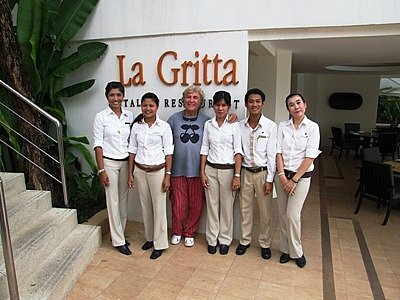 PHUKET: One of Spain’s greatest sports heroes, Ángel Nieto, was in Phuket recently enjoying a break and a good meal at La Gritta at the Amari Coral Beach in Patong before traveling to commentate for Spanish TV on the Sepang Moto GP in Kuala Lumpur. Ángel is one of the most successful motorcycle racers of all time, with 13 Grand Prix World Championships to his name. However, Ángel is a tad superstitious and refers to his GP record as “12+1”. He retired in 1986 at the age of 39 with a total of 90 Grand Prix victories, third only to the 122 by Giacomo Agostini, and the 103 of Valentino Rossi. In fact, he was present when Rossi equaled Angel’s record of 90 victories in 2008, and mounted Rossi’s bike at the finish line. With the Italian as a passenger, they took a victory lap holding aloft a flag emblazoned with “90 + 90”.